A place for Viv and her team to impart their latest thoughts and findings on a range of electrical and sustainability issues and offer advice on energy saving, installation and products. March 8th is International Women’s Day - a day set aside to celebrate the economic, political and social achievements of women throughout the world. Although we’ve come a long way since the Suffragette’s began fighting for equality one hundred years ago, according to the campaigning organisation ‘Jobs for the Girls’, ‘only one in every thousand electrical contractors is female’; an astonishing and saddening statistic. This month Athena Electrical is celebrating 24 years of working in the electrical contracting and renewable energy sector and we’d like to extend a BIG Thank You to all our customers who have supported this women-owned business. With limited funds for marketing, small businesses like Athena, know you have made an effort to find us; looking past the first pages of internet search engines, checking out customer reviews and recognising that a famous brand name doesn’t always mean great service. Although women represent 50% of the workforce, and despite recent attempts by the construction industry to encourage women into the trades, we are still massively under-represented in most trade professions. Please keep searching out women-owned businesses like Athena so that we can continue to grow and support a representative, green and local economy. A positive note to end the year! Award-winning Consumer advice website for all things renewable, Yougen have recognized Athena Electrical’s outstanding customer service and named us Installer of the month. Yougen aims to make it easy for the average person to learn about saving energy and generating renewable heat or electricity. The website provides practical information and common-sense advice on all aspects of energy efficiency and renewable energy, as well as helping consumers to find and choose the right local installer across the UK. When you’re looking for someone to install renewables, it’s vitally important you have confidence in the installer and feel comfortable with who you’ll be inviting into your home. Athena have received some outstanding recommendations which demonstrate how an installer can go above and beyond in making the installation process quick, thorough and informative for each customer. See Athena’s outstanding recommendations on their Yougen profile. 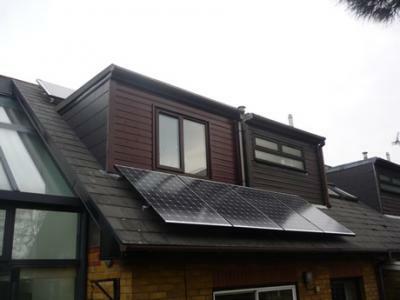 Back in 2012, Athena Electrical installed a 2.64kWp Solar PV System for Islington residents Howard Richmond and Robin Rubenstein. 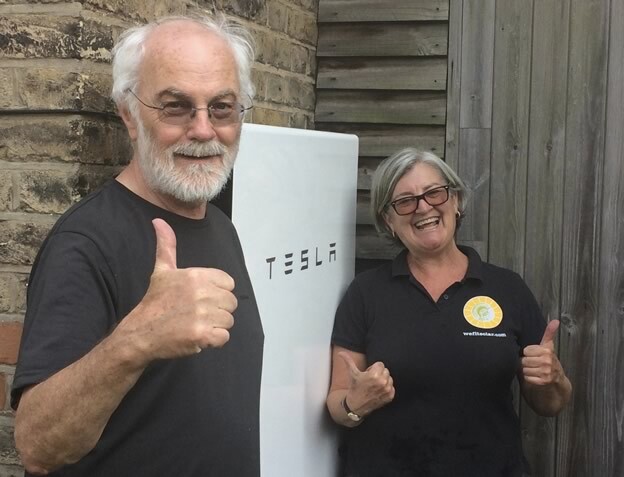 Passionate about the environment and keen to take a step closer to energy independence, Howard and Robin have become one of the first UK households to have the Tesla Powerwall 2 battery installed at their home. The Powerwall 2 works with their Solar PV system to store unused solar energy generated during the day and releasing it when needed during the evenings or on cloudy days. This means they won’t need to draw down as much energy from their supplier, reducing their bills and providing some protection from rising energy prices. With the future introduction of SmartGrids, Howard and Robin may be able to sell some of their excess energy back to the National Grid to help balance UK electrical energy supply and demand. With 13.2kWh storage capacity, and 100% depth of discharge, the lithium-ion Tesla Powerwall 2 battery has double the capacity of Powerwall 1 but is only 20% more expensive, offering Residents more power for their pound. The Tesla battery’s IP rating means it can be installed in a garage or outside and the Tesla App provides real-time energy monitoring of solar generation, household energy consumption and state of battery charge. Read why Howard chose to add storage to his Solar System. Why did you decide to install an energy storage system ? I am both a customer of, and supplier to, Good Energy plc so that I was already receiving all my electricity from renewable sources. However, I wanted to go one stage further and become as self sufficient as possible, at least during the summer months. I had read about battery storage and thought it was a good investment for my savings when they were otherwise losing value in my savings account with inflation being above interest rates. Why did you choose Athena Electrical to install the Tesla Powerwall 2? Athena installed my original 11 solar panel array in February 2012. 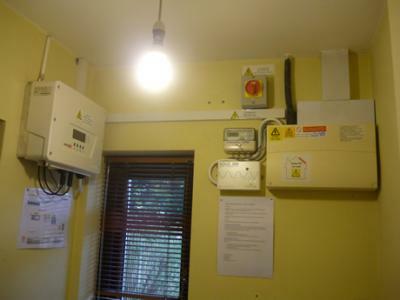 The timescale was very tight but Athena were so efficient, the installation was completed just in time for me to qualify for the maximum original Feed-in-Tariff just before the then government cut it. I have since more than paid off the cost of that original investment. Athena subsequently installed a hot water diverter to enable me to use excess solar electricity to heat water in the immersion tank. Since by then, I had formed a good relationship with the Athena team it was only natural that I would seek their advice on a battery system. I had heard about the Tesla Powerwall and so was pleased that they recommended the Powerwall 2. How did you find the installation process? Absolutely fine. As I recall it took two days. The battery is heavy so there has to be a suitable and easily accessible wall for it to be attached to. What do you think of the Tesla Powerwall 2 so far? So far I am very pleased. There is an excellent App, which allows me to view in real time the flow of electricity to and from the battery from the roof and to the house. Since installation about a month ago I have been about 97% self sufficient in electricity even though there have been many cloudy days. What would you say to other householders considering the installation of a battery storage system? Each householder needs to make their own cost benefit analysis since the batteries are quite expensive. In my case I am not so concerned about a there being a short-term pay back period. For me it is an investment for the next generation. I also assess that in the medium term the cost of energy is likely to go up much faster than inflation and that the payback may come sooner than current calculations will show. “It was wonderful to hear that we were the first people in Europe to obtain an extended warranty for our Panasonic VBHN285SJ40 solar panels. We chose the Panasonic VBHN285SJ40 panels after a very long discussion with our designer/installer Athena Electrical. There were several things we had to review, for example roof size, orientation, power requirements, etc. Athena were great and put up with a lot of questions on the best solution. We have 8 panels installed with 4 panels below a dormer and 4 above utilising SolarEdge Optimisers to maximise solar production. The panels, as well as supplying electricity for the house, supply power to our water storage unit via a Solic 200 Hotwater diverter. 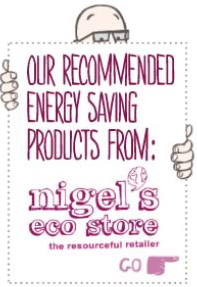 We moved into a 3 bedroom house in East London in September 2016, and our first thoughts were how to reduce our impact on the environment, it is important to us to tread lightly on this earth, it is not about saving money (that is a pleasant side effect) but helping the planet is key. We are sure you’ve heard the hype about the fantastic range of Tesla Electric cars. But did you know that Tesla has now developed a home storage unit incorporating their state of the art battery technology. The Tesla Powerwall stores energy generated by solar panels during the day to power your home during the evenings. Recently introduced to the UK, Athena Electrical is proud to be one of just a few authorized Tesla Installers. If you are fed up with the prices charged by the energy suppliers and would like to gain energy independence, consider combining solar panels with lithium-ion batteries to maximize self-sufficiency and save money on electricity bills. The sleek and stylish looking Tesla battery can be wall mounted internally or externally and has capacity to store up to 6.4kWh of electrical energy - more than enough to power most household’s night-time consumption. Once the battery has been emptied, your system will automatically switch to using energy from the Grid. Since the beginning of this year, Athena Electrical has been getting involved in energy storage and we thought you’d like to hear about a recent project in Stoke Newington. At the beginning of the month, Hackney Energy launched a ‘share offer’, giving local people the opportunity to invest in Hackney’s first ever community energy project, centred around the Banister House Estate. The fundraising target was set at £142,000 and we’re delighted to say earlier this week, when the offer closed, Hackney Energy not only reached that figure, but exceeded it. Reaching the share offer target is a wonderful boost, not just for renewable energy, but the local community and residents of the Banister House Estate, who will benefit. In the coming months, Athena Electrical will be installing 102kWp of solar electric (photovoltaic) panels on 14 housing blocks on the estate. We’re looking forward to continuing to work with the enthusiastic young people who live there, and who over the last year have been learning about the co-operative model, solar technology and energy efficiency. They’ll also be gaining paid work experience whilst helping Viv and the Athena Electrical team in the installation process. The whole project has been made possible and supported by Repowering London who have already set up and continue to run similar community energy projects in south London, and Hackney Council. A special mention should also be made to the 116 local people who have supported the generation of solar power in Hackney and taken a small, but important step to reduce our dependence on fossil fuels, by investing in Banister House Solar. In our last blog post, we mentioned that a report produced by Baroness Jenny Jones in the summer of 2014 entitled ‘London is ready for a brighter future’, highlighted that only one household in 260 in London has installed solar PV. There are a number of reasons why solar PV adoption has been so slow in the capital, but a UK wide, YouGov survey, commissioned by Rexel (a distributor of energy products and services) would suggest that one of the major stumbling blocks is simply a lack of understanding of the financial support that is available for the installation of solar and generation of renewable energy. The online survey with a sample size of 2,026 adults began by asking simple questions regarding concerns over energy price rises, cost of household bills and what actions they would take to help reduce energy bills. Leading on to more specific questions regarding solar it was obvious that many people think that they would be unable to afford the up-front and installation costs for solar PV. The most startling responses from the sample selection came when they were asked about the Feed-In Tariff (FiT) scheme, the government financial incentive for encouraging the uptake of household solar energy generation. An incredible 61% said they had absolutely no understanding of the FiT scheme what-so-ever, with a further 29% admitting they only had ‘some understanding’ of how the scheme works. Only 10% felt they fully understood the benefits of Feed-In Tariffs. The overwhelming majority of those who took part in the survey felt that solar will play a part in the future of the UK’s energy generation. The main problem seems to be that they couldn’t understand how, as householders, they could be an integral part in that future. 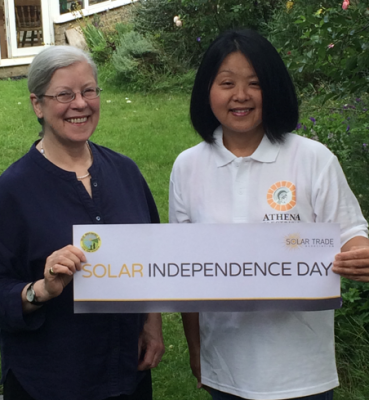 It seems loud and clear to us at Athena Electrical that a huge amount of people in the UK have absolutely no idea that when it comes to installing solar and generating their own renewable energy they have government support and financial incentives available to them. If this is achieved, then perhaps we can realise the ‘brighter future’ that Baroness Jones has predicted for London. London Is Ready For A Brighter Future - Are You? Believe it or not, London is actually one of the sunniest places in the UK. Despite this, the capital has the lowest uptake of solar PV across mainland Britain. It was for this reason that in July 2014, Green Party Assembly member, Baroness Jenny Jones produced a report called ‘London is ready for a brighter future’, a sentiment we agree with. The report highlighted that only one London household in 260 has installed solar compared to one in 32 in the south West of England. Even the north east of England and Scotland, (two areas with the lowest solar exposure) have installed more solar PV per house than in London. There are of course a number of reasons why more rural areas of the country have adopted a renewable energy future quicker than London, but at Athena Electrical, we firmly believe that many property owners in north London are being left behind as the growing trend is to look to renewables to secure our energy future. Baroness Jenny Jones’s report also noted that London has the potential to supply a fifth of its electricity from solar PV, which like other areas of the country would allow homeowners to ease away from the current grip of the Big 6 energy companies. 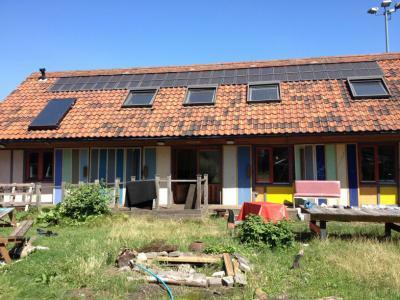 There has also been a recent surge across the UK in community energy projects, helping people to invest in local solar power, earn a good return and help their local community whilst combating climate change. 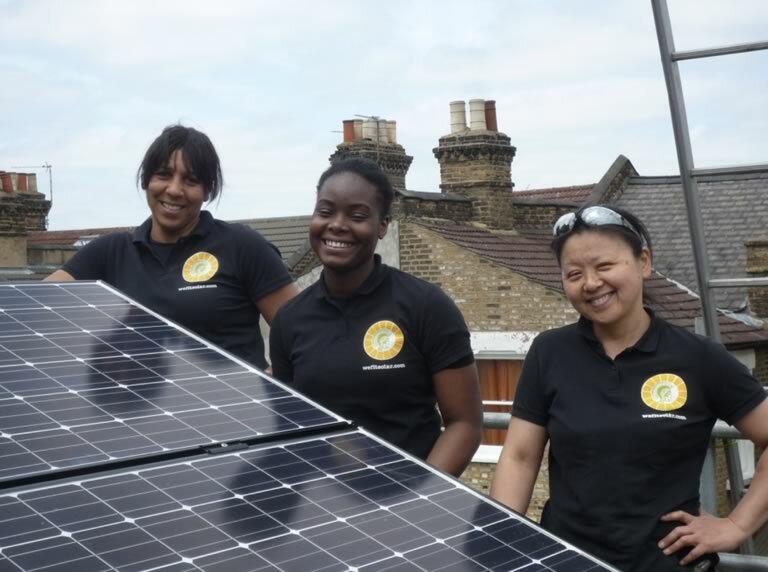 In the capital, Repowering London have been spearheading this movement and last year helped Hackney residents to set up their first solar energy co-operative. We are delighted to have been involved in this renewable energy revolution, and it has been wonderful to give local young people the opportunity to learn about the co-operative business model and gain practical skills. Having this grass roots involvement in local energy generation has really convinced us that there is no reason why residents in north London can’t help the capital to join the rest of the country in adopting renewable energy and making solar energy generation a reality. As Baroness Jenny Jones said, London is ready for a brighter future … are you? We recently told you about a project we were involved with at Homerton Grove Adventure Playground in Hackney, to find out why the solar panels they had installed 20 years ago had stopped working and see if we could fix the problem. 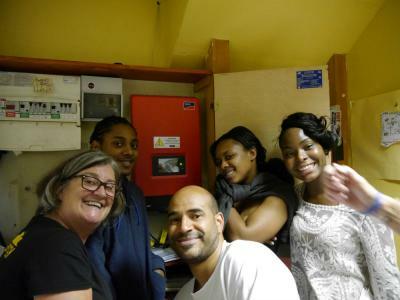 With the help of some interns from Hackney Energy's first community energy co-op at the nearby Banister House Estate, we managed to solve the problem and get their solar working again. Our combined efforts have been written about by the Hackney Citizen in a great article that highlights the importance of a solar future, accompanied by a quote from Green Party MEP for London Jean Lambert who came along for the launch of the new solar system. It also talks about how one of the interns has been inspired by learning about solar energy to use it to benefit communities in countries that are unable to rely on their own energy providers for electricity. 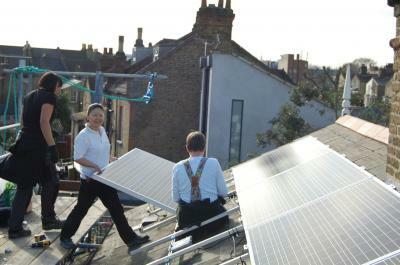 It's wonderful to see a small solar project in Hackney having such a positive effect. On Saturday 20th September, between 12pm – 2pm, as part of Community Energy Fortnight, Hackney Energy will be hosting an event at Homerton Grove Adventure Playground to celebrate the recent re-commission of the solar pv system. Community Energy Fortnight is taking place between 13th – 28th September, offering people the chance to explore and celebrate how communities across the UK are generating, owning and saving energy. One of the main aims of Community Energy Fortnight is to engage and inspire people about the benefits of community energy and encourage groups to set up their own projects. Please come along on Saturday 20th September and bring your kids to see the new panels, learn about solar and the plans that Hackney Energy have for the borough, and if you like, why not let us know your own thoughts on renewables in the area. 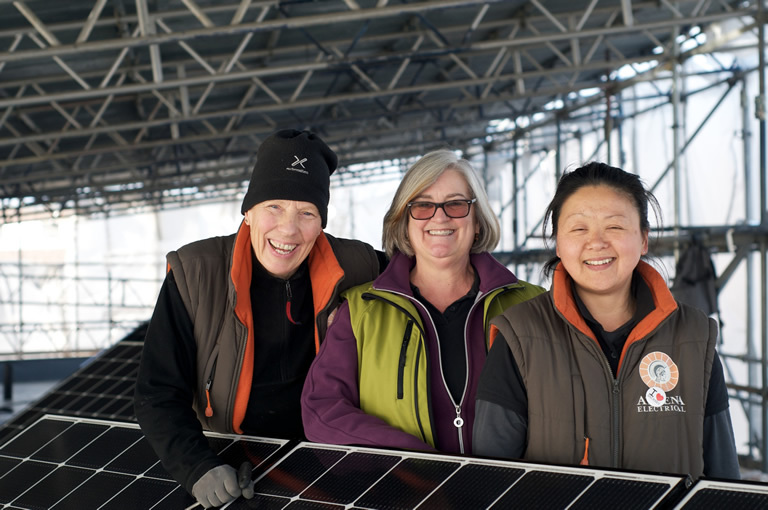 Last week Athena Electrical volunteered with Hackney Energy and some of the interns from neighbouring Banister House Solar Co-op, to find out why London’s first grid-connected solar pv tile system stopped working 2 years ago. 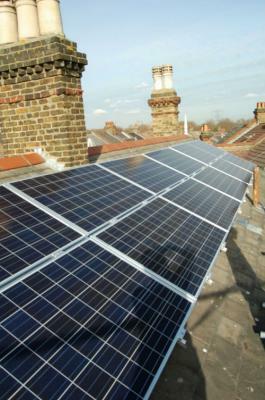 Designed and installed by Wind & Sun in 1995 at the Homerton Grove Adventure Playground in Hackney, the 1.94kWp Solar PV system was expected to generate approximately 1500kWh annually. We wanted to see if we could bring back Solar Power to the playground and it seemed only right that some of the interns we had with us, had used the playground themselves when they were young. Early tests showed that the solar panels were still producing well, but after more than 15 years in service and clocking up more than 32000kWh, the inverter had given up. After some adaptations to the wiring and the installation of a new inverter provided at subsidized cost by Wind & Sun, rain stopped just as the team finished testing the solar array. 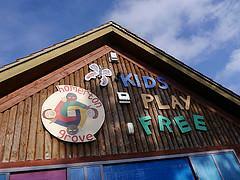 At 5 o’clock the sun came out and we switched on the system returning Solar Power to Homerton Grove. Bridget Handscomb of Hackney Play Association said she was delighted with the results of everyone’s hard work and looks forward to raising awareness and developing understanding of energy matters. 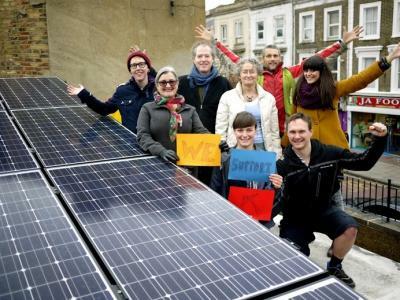 Hackney Energy is a group of enthusiastic Hackney residents working to set up renewable energy and low carbon projects that benefit the Hackney Community. If you have a solar project in mind and would like some support, the group would love to hear form you contact hello@hackneyenergy.org.uk. At the beginning of the year, we let you know that Hackney Energy, a community energy group, had been set up in Hackney with the aim of creating renewable energy low carbon projects in the area that will benefit local residents. We’re very pleased to report that Hackney Energy’s very first solar energy co-operative, in partnership with Repowering London and residents from Banister House Estate is now well underway in Homerton. 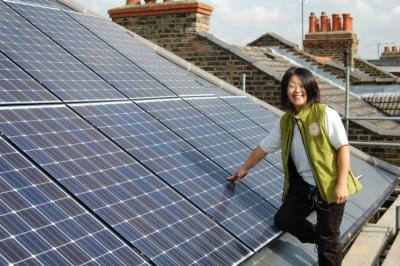 Seed funding to support the set up of Banister House Solar Co-op was provided by Hackney Council. Eleven young people from the estate have taken up internships to not only learn about the financial, technical, legal and structural elements of a renewable energy co-operative, but gain training in energy efficiency and receive vocational work experience installing the solar panels with the contractors. 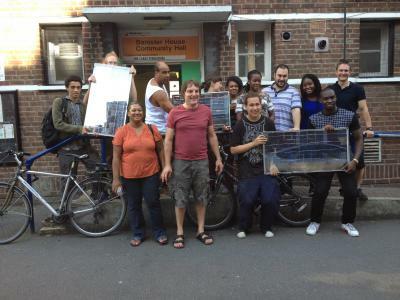 Last month Demand Energy Equality ran a workshop at Banister House Community Centre where the interns and members of Banister House Solar Co-operative had the opportunity to build and test their own solar panels from solar cells and reclaimed double glazed windows. When completed, Banister House Estate will generate more than 100,000 kWh of renewable energy a year from 480 community owned solar panels, saving an estimated forty-one tonnes of CO2 per year. All residents of Banister House Estate have the opportunity to buy shares for a minimum of £50, while other Hackney residents interested in supporting solar energy will be able to buy shares for a minimum of £250. All shareholders that make up the membership of the co-operative will have a say in how it is run, as well as receiving interest payments on their investment of approximately 4% a year. There are a growing number of community energy groups throughout the UK, so if you're interested in setting one up in your own area, then you might be interested in Energy Mentoring, a new initiative that has been established to offer advice, guidance and support for anyone in the early stages of setting up a community energy project or considering it. In our last blog post we mentioned the electric car rental scheme that will be unveiled in London next year, and the grants available for people interested in installing their own off street parking Charging Points. 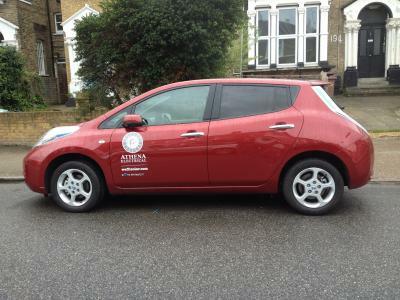 Keeping on the Electric Vehicle (EV) theme, there is a much anticipated uptake of EV usage in the next few years, and as a company that pride ourselves on our eco-principles, Athena Electrical have been leasing a pure electric car for the last six months, which you can see above. So what are the benefits? Well, aside from producing zero emissions, which benefits everyone, the cost of driving an EV is about six times cheaper than a petrol or diesel car. The cost to fully charge an EV is between £2 and £3, allowing you to drive up to 120 miles. If you have solar panels on your home you can use your FREE solar generated electricity to reduce your charging costs further. If that’s not enough to get your attention, then EVs are road tax exempt and if like us, you’re London based, then you will not have to pay the London Congestion Charge, which if you drive into the City regularly could save you up to £2,400 a year. Parking in London can also be quite pricey, but EV owners receive free charging and parking at Source London Charging points. On a more personal note, EVs have excellent acceleration and are brilliant to drive in London traffic and as they have fewer components than conventional vehicles will save you quite considerably on servicing and maintenance. Although EVs have a higher initial cost compared to petrol or diesel vehicles, Government subsidies are available and the long-term savings are quite considerable. 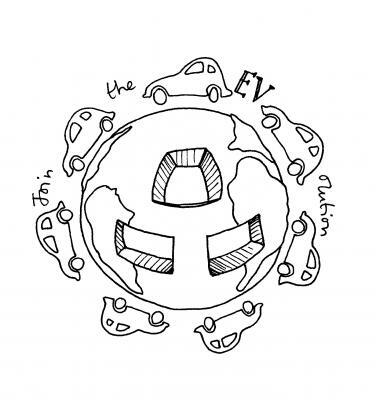 For more information about pure EVs, we suggest you take a look at the Energy Saving Trust website, which has information and videos that will hopefully answer any questions you might have, should you be considering joining the EVolution. There was understandably much in the news about the smog and pollution in London last week. One of the major contributing factors is vehicle pollution, which in itself is adding to the number of people affected by respiratory problems and other illnesses. A move towards low emission vehicles is essential if we are to ease pollution. This time next year, a brand new electric car rental scheme will have been unveiled by Mayor Boris Johnson in London, allowing users to borrow an electric vehicle (EV) for as little as £5 for 30 minutes. The proposed scheme follows a similar trial that has taken place in Paris over the last 3 years, which has been so successful, that over 10,000 journeys in 1,800 electric vehicles now take place in the French capital every day, which means that not only does it have more electric cars on the road than most other cities, but more charging points. In preparation for next years EV scheme, and to help stimulate the uptake of electric vehicle usage, the Government has committed £13.7 million for the installation of domestic off-street parking Charging Points. As recently qualified installers and in association with the government’s Office for Low Emission Electric Vehicle (OLEV) grant funding, Athena Electrical can offer you a free Domestic EV charging station, even if you don’t plan to purchase an electric vehicle. To be eligible, you must have an off street parking space and agree to let OLEV collect charging data for 3 years. We will take care of the grant application and paper work, and you will not be asked to contribute any funds for the installation of a 3kW domestic charging point. However, as part of the grant eligibility, you must keep the Charging Point switched on so that the government is able to collect the data transmitted by the meter over the next 3 years. By agreeing to have a Charging Unit installed in your off street parking space, you will be supporting the adoption of electric vehicles in to the city, improving the environment and air quality of the local community, and, should you wish to purchase an EV in the future, save yourself the cost of the installation. If you would like to join the EVolution and have a free Domestic Electric Vehicle Charging Point installed at your home, please get in touch. March 8th is International Women’s Day - a day set aside to celebrate the economic, political and social achievements of women throughout the world, the seed of which was sown by the Suffragettes in the early 1900’s. This month Athena Electrical, an independent, women owned company, is celebrating 20 years of working in the electrical contracting and renewable energy sector. According to the campaigning organisation ‘Jobs for the Girls’, whose aim is to encourage women in to the electrical contracting industry, ‘only one in every thousand electrical contractors is female’; an astonishing and saddening statistic. Although women represent 50% of the workforce, and despite recent attempts by the construction industry to encourage women into the trades, we are still massively under-represented in most trade professions. Viv has been working as an electrician for more than 30 years and after setting up Athena electrical in 1994 has provided employment, training and encouragement to enthusiastic and skilled female electricians. This week, three of Athena’s team were up on a roof, enjoying the break in the rain and working hard to install a 3kWp Solar PV system on a property in Clapton. This weekend we will be checking out our local events because although International Women’s Day is a worldwide celebration through concerts, talks, exhibitions and much more, we like to emphasise events happening locally. You can search for events in your area through the IWD website, but to whet your appetite, here are a few London based goings on around our own area of north and east London. In many cases, events are not just confined to the 8th March, but are running through the whole month. Saturday 8th March – The London Arte Chamber Orchestra will be performing a special concert celebrating IWD at St Mellitus church in Finsbury Park. Monday 10th March – ‘The Female Showreel’ at Rich Mix on Bethnal Green Road. Female panelists will be discussing gender issues in the media, such as Page 3, prejudice against women and lots more. If none of those events take your fancy, then there’ll sure to be something that will, so why not attend an event and help support International Women’s Day 2014. Following in the footsteps of Brixton Energy, we are delighted that a local energy community group was set up last month in Hackney. Not surprisingly, the initiative has caused considerable interest in the local press and with residents, eager to find out what kind of difference this could make to Hackney. Hackney Energy is a not-for-profit organisation whose aim will be to work towards a positive future for the borough by setting up and managing energy co-operatives; its focus being the local community and sustainability. The main issues Hackney Energy will tackle are social and environmental and the idea in essence is quite simple. 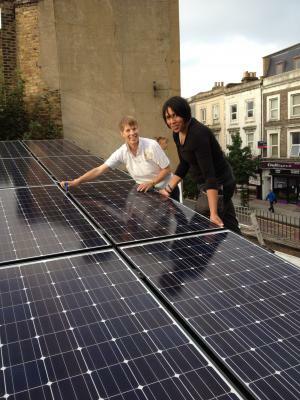 The community invest in Hackney Energy themselves so that they can launch projects, such as installing renewable energy sources on buildings. The income generated, then goes towards further projects, bringing about positive change. Hackney Energy has arrived at a time when more and more people are beginning to question the role and ethical status of the major UK energy companies, known collectively as ‘the big 6’. As customers become more disillusioned with the service they are being provided, the cost of energy and the manner in which many of these companies seem to operate, it's not surprising that community run energy co-operatives such as Hackney Energy seem, not only a positive change, but a very viable alternative. It is perhaps no coincidence that a recent survey by Which! (the consumer watchdog) placed two renewable energy companies Good Energy and Ecotricity top of the list of the UK’s energy suppliers. Hackney Energy is run by local residents in partnership with Re-Powering London and there are numerous ways you can get involved, whether by volunteering, attending community meetings or through donations. As the projects gather momentum, there’ll also be an opportunity for work experience, not only learning about the management and running of an energy co-operative, but getting hands on experience with solar installations. 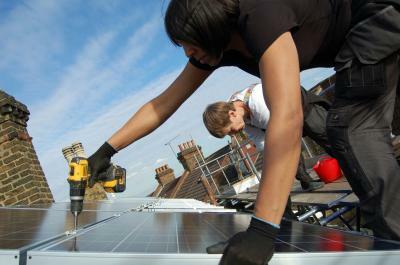 We look forward to writing about Hackney Energy’s first project in the not too distant future. Last year, we were contacted by a local Stoke Newington resident, David, who has been living in his Victorian house for 19 years. Unfortunately, a couple of years ago, a burst pipe outside his home caused severe flooding of the property and meant that he was forced to completely strip out the basement in order for it dry. Rather than lament an unfortunate, inconvenient and not to mention costly mishap, David turned his misfortune to his benefit by reconfiguring his house to not only make it far more energy efficient, but save money on energy bills long term. Athena Electrical were delighted to get involved in David’s forward thinking plans, and installed solar PV on the roof. We also installed a system called Optimmersion. If the panels are producing more electricity than the house can use, the surplus energy is used to run the immersion heater. In practice, this provides almost all the hot water required in the summer. The boiler runs off gas, and produces maximum electricity (1kW) when the boiler is running at 20% of its maximum power. Running the boiler at higher powers produces no more electricity. 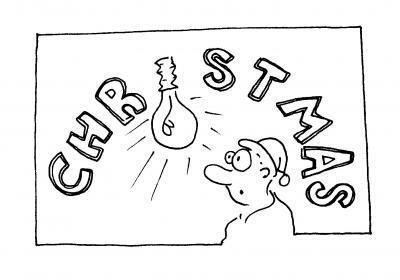 As David says "it’s better to use less power over a long period than high power for a short period. We put in water-based under floor heating in half the house to do that”. Having retro-fitted his house, David’s energy use is significantly lower, with perhaps the biggest improvement to his drafty Victorian building being the inclusion of insulated plasterboard inside the walls. We should perhaps also mention, that as part of the whole re-fit, David added double-glazing to the windows and all of these combined energy efficiency measures means that his property has now achieved a Band A energy performance rating which is extremely rare for a Victorian house. He is now producing as much electricity as he uses. The solar panels have produced about 2600 units in a year - mainly in the summer. The boiler has produced about 1700 units - mainly through the winter months. Being the only MCS accredited solar PV installer in the Hackney area brought David to our door, and we carried out the installation with minimum disruption to him and his home. David says he is ‘very happy’ with the improvements. ‘It feels like the right thing to do”. We wish him all the best for his energy efficient future. December is upon us and Christmas is just around the corner, so rather than extolling the virtues of home insulation or great ways to minimise your heating bill (which we of course can, should you so wish), we thought we’d tell you about a couple of local happenings that will warm your heart and even your stomach. The first comes courtesy of Millfields Community School, a primary school in Clapton. They’ve had the rather brilliant idea of releasing a Christmas Song to help them raise funds for a new playground, whilst donating 20% of sales towards UNICEF’s ‘Sing for Syria’ campaign. The song, written by a local resident, is very aptly named ‘C-H-R-I-S-T-M-A-S’ and has been recorded by 620 pupils from the school, aged between 5 and 11. Not content with just recording it, the kids also feature in their very own music video made by two parents. You can download the song for just 99 pence and not only will you be helping the kids to get a new playground, but they might even reach number 1 in the charts. The temperature, as you can’t have failed to notice has been dropping quite significantly, so what better time to enjoy a delicious warming stew. We can highly recommend popping in to the newly opened Maeve’s Kitchen in Clapton, who in their own words, serve up ‘one pot dishes with a no nonsense approach’. This rather homely restaurant has been set up in memory of the author Maeve Binchy (who died last year) by local resident and Artistic Director of Shakespeare’s Globe Theatre, Dominic Dromgoole, who was a close family friend of Binchy. They’re open every day of the week except Monday, and their slow cooked stews are proving popular, so we suggest booking first to make sure you get a table. So, there are two suggestions to warm up and enjoy your December. Enjoy. We are delighted to have been involved with an inspiring project that is about to open in Clapton, east London. On November 7th 2013, the UK’s first solar powered luxury, mixed use public toilets will be unveiled on Brooksby’s Walk, just off Chatsworth Road. Athena Electrical have supplied and installed a 3.84kWp solar panel configuration on top of the public convenience, which will not only supply renewable energy to the toilets, but to the café/bar/restaurant which will also be making its home in the building. The whole pioneering project has been spearheaded by the ‘Clapton Improvement Society’, a growing band of locals intent on bringing derelict land and buildings back in to use, creating educational opportunities for disadvantaged people, providing cultural and creative activities and building assets that will prosper the community. They currently have 1,200 members. The toilets themselves had been derelict for almost 20 years, and when Hackney Council submitted an application to have them demolished, it was opposed by the Clapton Improvement Society. They collected hundreds of signatures on their petition, suggesting instead that the area would benefit from some well-maintained public toilets, operated and looked after by locals, according to a sustainable plan. Eventually, a lease was negotiated with the Council, and after securing a conditional Lottery award for the solar panels and 4 months of hard work from an array of local electricians, builders, plumbers and carpenters, the toilets are almost ready to open. The toilets themselves will flush using rainwater collected from the roof. Aside from the toilets, you’ll be able to sit down and grab a tasty treat from ‘The Convenience’, a community café run by Nana; enthusiastic older ladies keen to serve up nostalgic treats from your childhood. The café will also host regular ‘events in the gents’ such as film screenings and gigs, and if that isn’t enough, the old toilet comes complete with its own roof terrace. Not happy to rest on their laurels, the Clapton Improvement Society already have their sights set on building a Hydro Turbine on the River Lea which they hope to finance through a crowd-funding campaign supported by local residents. If all goes to plan, the money recouped through generating their own renewable energy will go straight back in to making further improvements in Clapton. For now though, we’re looking forward to the opening of the Brooksby’s Walk toilets on November 7th.